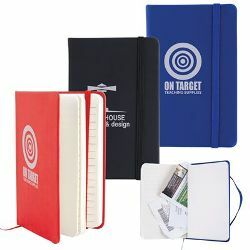 Change the traditional promotion products with elastic closure notebooks from WA PRINTING. They are really stylish travel companion with PU bond cover, bookmark, elastic closure and expandable inner pocket. WA PRINTING guarantees that these notebooks will worth your money in different ways, making your brand distinct from the others. Please feel free to contact us for more information regarding the products, at WA PRINTING, you will always find out the best solution meeting your needs. ITEM SIZE(MM) 94L x 143H x 17D. PRINT AREA(MM) Screen Print - 50L x 70H, 4CP Digital Print - 90L x 139H. COLOURS Black, Blue, Red, White.